It might be a little bit early in the season for me to be pulling out my ice cream maker considering there was still snow on the ground a couple of days ago. However, I'm going to argue that every season is ice cream season especially when it comes to delicious home made ice cream. I've had these raspberries in my freezer since I picked them last summer. Every time I opened the freezer I could practically hear them begging me to stop making them into healthy breakfast shakes and use them in a batch of sweet and tart creamy raspberry ice cream instead. Who am I to ignore the cries of my freezer raspberries? Raspberries have a lot of seeds so before they can be added to the ice cream they need to be pureed and then strained/stirred through a sieve. It's an extra step that's worth it because the ice cream's silky texture is better when it's not interrupted by having to pick little seeds out of your teeth. For the ice cream recipe I started with the vanilla base that I always use and then modified it to take into account the tartness of the raspberry puree. I upped the whipping cream by a 1/2 cup and increased the amount of sugar just enough so that the raspberries still have a bit of tang but no sourness. 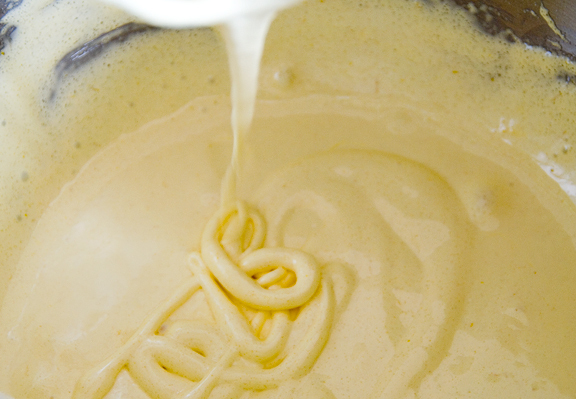 The vanilla custard base is made first and cooked on the stove until it thickens slightly. The raspberry is then stirred in after which keeps it fresher tasting than if they were cooked together initially. The raspberry custard goes into the fridge until it's chilled completely so that it can freeze properly. When I was growing up in Kelowna we had a ton of raspberry bushes and my mom used to make us the most delicious raspberry ice cream. The ice cream maker we had was a bright red one that you had to crank by hand and we would take turns doing it. .. and makes the custard into frozen deliciousness like magic. This ice cream maker has gotten some good use and each time I use it I think about what a good purchase it was. The ice cream is like soft serve when it's straight from the ice cream maker. To make it into scooping consistency I just spread it into a tupperware container and stick it in the freezer for a few hours. The extra whipping cream makes this ice cream incredibly smooth and rich. When I make vanilla ice cream I use less whipping cream but with the tart raspberry puree the extra richness works well with the berry flavor. I can't wait till summer when there will be tons of fresh fruit and berries to add to my ice cream recipes. For now, I think my freezer raspberries are much happier (or at least I am). Note: This makes enough ice cream that I usually have enough to freeze it in two batches. If you don't need that much ice cream or don't have a second frozen bowl for your ice cream maker then make a half-recipe instead. 2 cups of strained raspberry puree (It took a little over 5 cups of frozen raspberries to make this much puree for me) See tips below. 5. Chill custard in fridge with plastic wrap placed directly on the surface to prevent a skin from forming. I like to chill mine over night. Then churn in an ice cream maker and either enjoy it as a soft serve ice cream right away or put it in your freezer to firm up and enjoy as scoops of ice cream. Tips: To make the puree I blend the (thawed) raspberries with a stick blender and then stir them in a sieve until just the seeds are left. Its better to err on the side of ending up with more puree than you need for the recipe because you can always freeze the remaining puree in ice cube trays to throw into other recipes or into glasses of sprite (yum!). I mentioned your blog on the Facebook site of the Vanilla Bean Company as a blog that I read regularly because your baking is so lovely. I hope that is ok. It is warm in my place now, and I just have finished my dinner ... such creamy, fruity ice cream just looks irresistible. By the way, can't access the link to 'ribbon stage'. Mmm, these look absolutely heavenly! I have to try making them! Never too early for ice-cream I will say :) Your raspberry ice-cream looks so good! Excellent way to use up frozen raspberries! Looks yummy and makes me miss making ice cream. We have that same ice cream maker. I really should use it more often. Mmm. I'm glad you're making ice cream already! You're making me feel less guilty for eating ice cream all through winter. I haven't tried raspberry ice cream before though - I'll be changing that soon! Stephanie, lucky you with those freezer berries! We planted raspberries in our back yard a couple of years ago, I'm hoping this is the year that we get a bushel full. And thanks to your yummy recipe, I will know how to use them. Never ignore the cried of freezer raspberries! Yum! This is delicious. I need to try the raspberry ice cream asap. We recently made this and followed your directions to a T, except I used Half-and-Half instead of the whole milk. I don't have a stick blender so we used the blender and strained it in a chinois. We also added at the end some Ghiardelli Chocolate Chips and also a broken up imported chocolate bar that contained freeze-dried raspberries! Talk about good. Began with 32 oz. of frozen raspberries and had 1/8 cup too much. So I made VERY small ice cubes (6) out of that 1/8 cup like you suggested. Then I'd add a small cube to a big glass of powdered raspberry-tea that we drink daily. Absolutely delicious. A mint sprig added a lot as well. Thanks for the recipe. My husband already bought 32 oz. of frozen strawberries to try the next time we make this!